It is a period of rebirth at Walt Disney Productions. 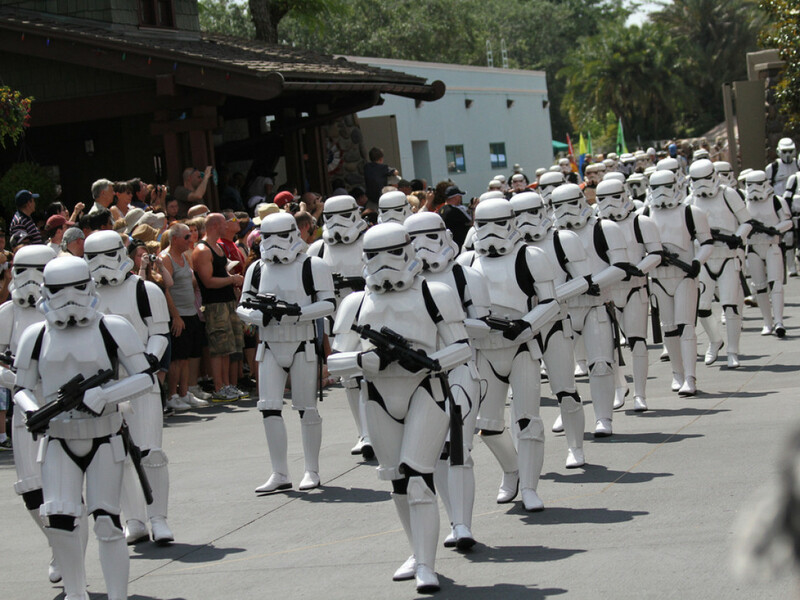 Although the company had almost been destroyed by an evil empire of corporate raiders, a small band of freedom fighters led by Roy E. Disney thwarted the attack and restored order to the company. New CEO Michael Eisner and president Frank Wells have dispatched the creative wizards at Walt Disney Imagineering to restore hope to the company’s theme parks in the form of innovative new rides and attractions. Sorry about that, but I couldn’t resist. How often do you get to write your own Star Wars crawl? 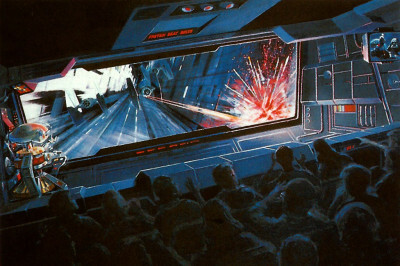 Plus it was a good way to quickly recap part one in this series of posts on the creation of the original Star Tours. Tony Baxter had actually been part of the first Disney group to meet with George Lucas back in 1984. To this day he speaks of how positively surreal it was to meet with then-Disney CEO Ron Miller at his Silverado Vineyard in Northern California to talk Star Wars with George Lucas over chicken salad sandwiches…served up by Ron’s wife, Diane — who also happened to be Walt Disney’s daughter! Now, with an agreement in place to bring the Star Wars galaxy to Disneyland, Tony officially came onboard the project as director. Tom Fitzgerald was a young writer-producer — and not so coincidentally a Star Wars fan — working in Imagineering’s in-house film production unit. Tom quickly signed on to write the script and serve as the project’s show producer. He immediately set to work developing the attraction’s story with George himself, ILM’s master visual effects artist Dennis Muren, Tony Baxter, and the rest of the Imagineering project team, including, among many others, Orlando Ferrante, Chris Tietz, Gil Keppler, Chris Runco, Greg Wilzbach, Shim Yokoyama, and Stan Abrahamson. The creative team considered everything from an underwater cruise through the swamps of Dagobah to a time-travel conceit that would allow them to go anywhere they wanted in the Star Wars galaxy. Tom even contemplated a Jedi training concept that would ultimately lead to the Disney Parks’ popular Jedi Training Academy experience decades later. The Imagineers ultimately decided to tell something of a “sequel” story set shortly after the events of Return of the Jedi. 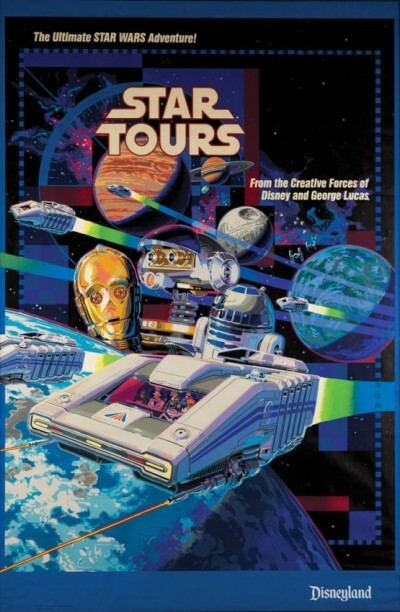 The ever-present droids C-3PO and R2-D2 have found new masters — and new employment — at Star Tours, an intergalactic touring company loosely inspired by classic Hollywood bus tours. 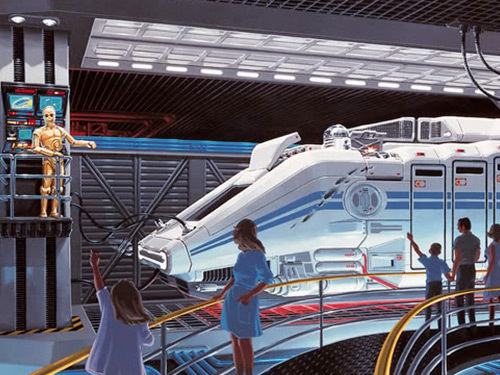 But instead of cruising the Hollywood Hills on a sightseeing tour of movie stars’ homes, Star Tours would embark on routes through a galaxy recently made safe by the Rebel Alliance’s decisive victory over the Empire. 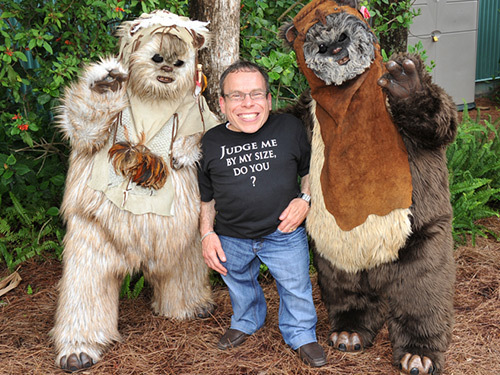 The tour line’s ads promise comfortable cruises to the desert planet Tatooine, the remote ice world of Hoth and the lush forest moon of Endor, “home of the lovable Ewoks” (especially Warwick Davis, which as you may remember from an earlier post, I learned the hard way!). 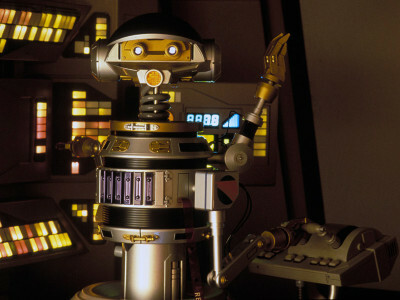 George Lucas came up with the idea of having a droid for a pilot, a character who would literally drive the story and narrate the experience much like the infamous Jungle Cruise skippers across the park in Adventureland. The filmmaker initially envisioned a brash veteran of the Clone Wars, not unlike a robotic version of Han Solo, but Tony Baxter suggested a more timid and decidedly nervous rookie on his first flight, and RX-24, or “Rex,” was born. But who would help bring the newest addition to the Star Wars galaxy to life? A certain helium-voiced hysteric had been growing in popularity since The Pee-Wee Herman Show first aired on HBO in 1981. 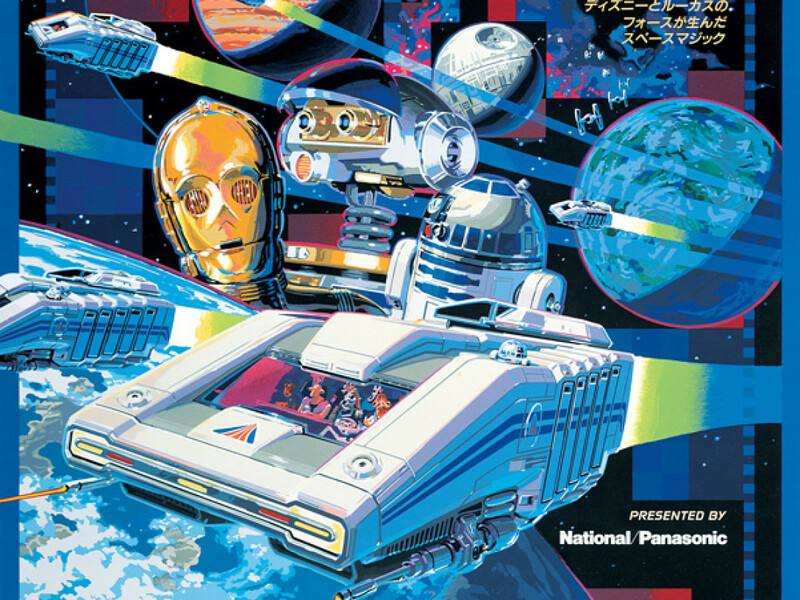 When Star Tours was in active development in 1985, Pee-Wee’s Big Adventure was one of the biggest hits of the summer movie season, so Tom Fitzgerald thought Paul Reubens would be the perfect candidate to steer their Starspeeder 3000 off course. Joining Paul in the cast was everyone’s favorite protocol droid, Anthony Daniels himself, who not only came onboard to voice C-3PO, but also acted out the entire pre-show so the Imagineers could shoot reference footage to later help guide the programming of his Audio-Animatronics counterpart. 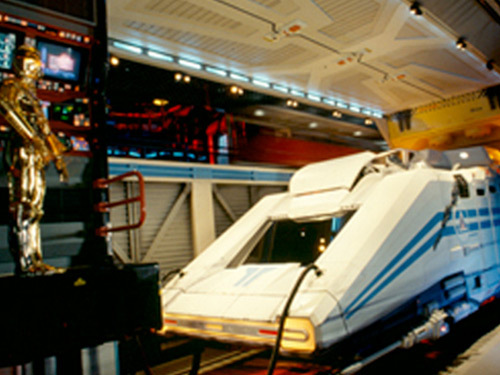 Both incarnations of Star Tours still occupy a special place in Anthony’s heart, due in no small part to the fact that he didn’t have to squeeze into the suit and perform the show day after day – he now had an expertly programmed Audio-Animatronics figure to do it for him! Tom Fitzgerald even got in on the act, providing the voice for one of the G2 droids in the pre-show. The two worker droids, G2-4T and G2-9T (voiced by Tom’s fellow writer Mike West), took their names from the singing “geese” the figures had once played in in Disney’s Audio-Animatronics musical, America Sings — and so “G2.” Stripped of their artificial skin and feathers, the Audio-Animatronics figures looked perfectly at home in the Star Wars galaxy. 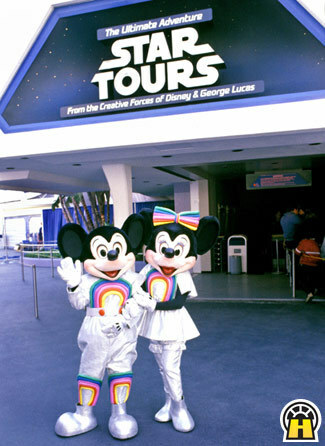 As for the space flight itself, George was also set on taking a time-honored Disney tradition and turning it upside down. Disneyland had long been known as “The Happiest Place on Earth,” a Magic Kingdom where guests could forget about their cares and just relax and enjoy themselves…so George thought it would be a lot more fun to tell a story in which, wait for it, “something goes horribly wrong.” And so the experience begins with an addled Rex immediately piloting our Starspeeder 3000 off-course and almost crashing guests into a maintenance bay – and it all goes downhill from there! Rex ultimately lands his passengers in the middle of one of the last remaining skirmishes between the Empire and the Rebel Alliance, getting caught in the crossfire between X-wing starfighters and Imperial TIE fighters. The adventure culminates in an all-out assault on the Death Star, skimming across its surface a la Return of the Jedi before embarking on the signature trench run from A New Hope. Was this a previously unknown third Death Star that had somehow evaded destruction? Didn’t matter. There was no way the Imagineers were going to create a Star Wars flight simulator attraction and not include the trench run, which is something that kids of all ages had wanted to do since May 25, 1977. With both the story and the cast falling into place, now “all” the team had to do was, you know, create the actual flight to Endor. George Lucas and Star Wars veteran Dennis Muren put together a small team of visual effects wizards at Industrial Light & Magic, who would be called away from other projects of the time like Back to the Future, The Goonies, and Young Sherlock Holmes and return to a galaxy far, far away for the first time since the release of Return of the Jedi two years earlier. A new Star Wars film was once again in active production at Lucasfilm. But this time the adventure was real. 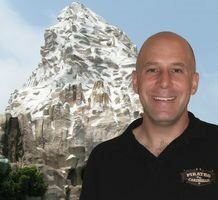 Jason Surrell is an author, screenwriter, and senior show writer at Walt Disney Imagineering. Follow him on Twitter at @2Manhattans.